Ophir Tal is the 14th Street Y’s shaliach, or “emissary,” tasked with bringing Israeli culture to New York. Here, he discusses why he decided to bring Mimouna, a traditional North African post-Passover interfaith gathering, to the 14th Street Y. For tickets to this year’s Mimouna, click here. The year: 2014. The place: Ashdod, Israel. My grandma was hosting me for Passover and insisted upon adding a little flavor to it. Mimouna started in North Africa. On the day after Passover, it was an opportunity for Muslims and Jews to gather. The Jews opened their houses and hearts to their Muslim neighbors, and the Muslims brought the leavened sweets and pastries that the Jews had avoided during Passover. “Did you know that I’m Moroccan?” my grandmother joked. My grandma was the most Polish woman ever, yet still, in her own eyes she was Moroccan. “I tell everyone that I’m from Fes, even though I’m not,” she said. The Mimouna in Ashdod wasn’t the first one I ever saw, because in Israel almost every sensible politician attends the Mimouna of one of his main supporters. But, even though I’m not fully Ashkenazi, I never had the chance to experience Mimouna before. The sight was surrealistic: the Jewish and Israeli participants embraced clear elements of the Arab-Moroccan culture, mainly music. 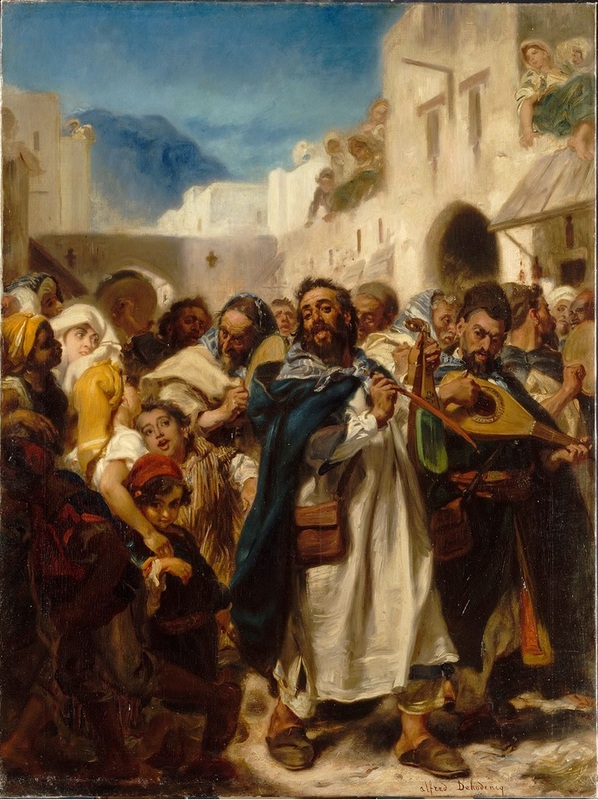 Jewish Festival in Tétouan,_Alfred_Dehodencq,_1865. Source. Of course, the simple answer is that they are remembering a part of their own culture and respecting the tradition of their fathers. And still, something in that answer wasn’t satisfying. 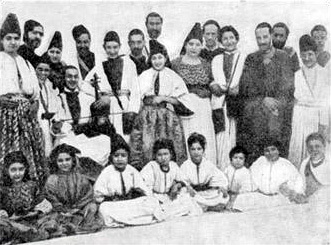 Jews of Fes c. 1900. Source. I chose to take her advice. But I realized it would be wrong to celebrate traditional gathering of Muslims and Jews without any Muslims. Why is this element missing from an Israeli Mimouna? Because Jews and Muslims are in conflict and interfaith options are less accepted in that atmosphere. But maybe it could work in New York. So this is what this Mimouna is really going to be about: to see what happens when Jews and Muslims meet outside the loaded space of the Middle East, and embrace an often-forgotten element of Mimouna: the Muslim-Jewish interfaith dynamic. As an Israeli, I hope we’ll take the opportunity to reflect and examine how our culture is in fact a salad that mixes elements from the East and West—just like my family. Maybe that’s what my grandma meant to say this entire time.